Capacity 30 lbs Breed type for this size crate could be Pet Gear Generation II Soft Crates are very spacious yet can be folded flat for easy portability. The interior waterproof mat and fleece pad are both comfortable for your pet and easy for you to clean. Length: from nape of neck (where collar falls) to base of tail. Height: from shoulder to floor. Top, front, and side zippered doors make your pet very accessible. Because if the size you choose is too small, it will not do at all. Pet Gear Generation II Deluxe Portable Soft Dog Cat Pet Crate Carrier Red 27"
Length: from nape of neck (where collar falls) to base of tail. Height: from shoulder to floor. Top, front, and side zippered doors make your pet very accessible. Size:27" L x 18" W x 21" H. Because if the size you choose is too small, it will not do at all. Unzip the sides to allow the carrier to expand 3. For small pets only. Fleece-Top Comfort Liner. Included tether can be attached to your pet s harness for extra safety. Two side storage pouches for your pet s extras. 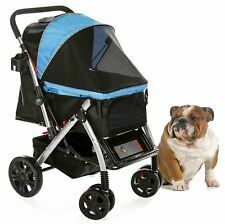 Pet Gear Soft Crate Generation II Deluxe Portable 21". Capacity 15 lbs Breed type for this size crate could be Maltese, Havanese, Shih Tzu. Ocean Blue. 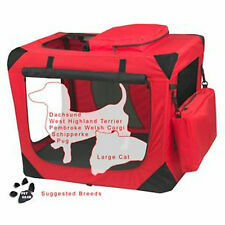 Pet Gear Generation II Soft Crates are very spacious yet can be folded flat for easy portability. The MPN has LV on the end of it. Breed type for this size crate could be Pet Gear Generation II Soft Crates are very spacious yet can be folded flat for easy portability. Capacity 50 lbs. The interior waterproof mat and fleece pad are both comfortable for your pet and easy for you to clean. Color: Moss Green. Length: from nape of neck (where collar falls) to base of tail. Height: from shoulder to floor. Top, front, and side zippered doors make your pet very accessible. Because if the size you choose is too small, it will not do at all. Fleece-Top Comfort Liner. Included tether can be attached to your pet s harness for extra safety. Two side storage pouches for your pet s extras. For small pets only. The Traveler Plus features wheel covers to help keep your car & clothes clean while carrying your pet.